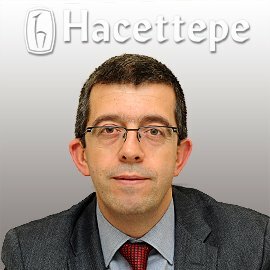 Professor Mustafa ARICI is Professor of Medicine (Nephrology) at Hacettepe University in Ankara-TURKEY. He undertook his undergraduate and postgraduate educations in Faculty of Medicine, Hacettepe University. He received his residency training in Internal Medicine (1992-1996) and served a fellowship in Nephrology (1997-2000) in the same faculty. He has awarded a training grant from International Society of Nephrology (ISN) and studied in the field of “proteinuria and renal fibrosis” for two years in the Department of Nephrology, University of Leicester, UK as an ISN fellow. His main research interests are clinical problems of end-stage renal disease and hemodialysis patients, mechanisms involved in progression of chronic kidney disease, hypertension and renal damage and familial Mediterranean fever (FMF). He acted as principal investigator in the “PatenT(Prevalence, awareness, and treatment of hypertension in Turkey), HinT(Hypertension incidence in Turkey) and SALTURK (The Relationship between Hypertension and Salt Intake in the Turkish Population) studies”. which were nationwide studies carried out by Turkish Society of Hypertension and Renal Diseases. He is a member of the “Turkish FMF Study Group”. He has acted as an investigator in several international studies in the field of nephrology and hypertension. He was elected as a “Member of Board” to Kidney Disease Improving Global Outcomes (KDIGO) in 2006. He was former “General Secretary” of Turkish Society of Hypertension and Kidney Diseases. He is an “Educational Ambassador” for International Society of Nephrology and member of “Regional Advisory Group” for International Society of Hypertension. He was the author or co-author of numerous articles and book chapters in Turkish and English. He serves as an editorial board member in “Nephrology Dialysis and Transplantation” and as an associate editor in “BANTAO Journal”. Mustafa ARICI is a member of the Science Academy,TURKEY.